Gerber Legendary Blades adds a new dimension to the "Gentleman's" knife with the introduction of the Mini-Paraframe. 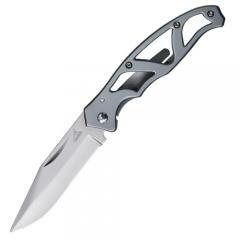 Perfect for the person who wants to carry a lightweight folding knife in their pant or suit pocket. The 2.25 inch blade of the Mini Paraframe is ground from high grade surgical stainless steel and is securely held in place with a "frame lock". The clip, also stainless steel, is designed to function as a money clip as well.